Andy Duncan’s first book, Beluthahatchie and Other Stories, was a superb collection of short fiction. Dripping with voice and style, each piece was carefully crafted, occupying a wholly unique perspective, from the ghosts that haunted General Patton to a small southern town’s witnessing of a criminal execution. 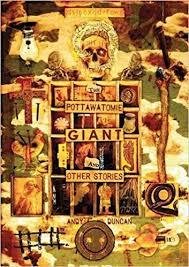 Picking up where he left off, Duncan’s second collection The Pottawatomie Giant and Other Stories (2012) is everything the first collection was, and comes just as recommended. As mentioned in “Fortitude”, Duncan explored possible motivations for Gen. George Patton’s strength of character. A sort of secret history, or “missing biography” type of story, in “The Pottawatomie Giant” he returns to the form to tell the unknown side of an early 20th century boxer’s tale, Jess Willard. A massive man known for his ability to take a punch, beating the then consensus champion Jack Johnson and becoming world champion himself, Willard was skyrocketed into fame, but was never really comfortable with it, as witnessed by his altercation with Harry Houdini. Duncan looking at Willard in old age, it’s an interesting story that twists on itself under Duncan’s quality pen. Another semi-biographical tale, this time of a historical figure few will be aware of, “Zora and the Zombie” looks at real-life anthropologist and writer Zora Neale-Hurston and a trip she takes to Haiti to study the local culture. Voodoo all around, Duncan uses the story to understated effect to balance feminist concerns across traditional and contemporary culture. A pair of tales feature the quietly strong, wonderfully quaint Southern girl, Pearleen Sunday. In “A Diorama of the Infernal Regions, or The Devil's Ninth Question”, Sunday, in a moment of minor trauma, accidentally transports herself through Professor Van Der Ast’s diorama and ends up in Mrs. Winchester’s ghost-filled house. Eventually meeting with Ol’ Scratch himself—something which drags out of her the realization of her own abilities, it’s a story you just grab a hold of and hang on. Told several years later, “The Dragaman's Bride” is a fiery story (har har)—an Appalachian tall tale with grit. The prologue, involving a sheriff chasing a young woman through a thunder storm, grabs the reader by the small hairs, and the resolution of why he is chasing her just as satisfying. Like Duncan’s “Fortitude”, “The Chief Designer” is an alternate-view, biographical novella looking at a lesser yet key figure from history. Looking at the life of Sergey Korolyov and his impact on the Russian space program throughout the latter half of the 20th century, Duncan once again converts history into material saturated with interest without sacrificing the humanity. Entertaining, informative, and ultimately ruminative, it’s among the best stories Duncan has ever written. (Longer review here.) Capturing an amazing character voice, “Close Encounters” takes a look at UFO sightings through the eyes of a poor elederly man who once purported to have been abducted by aliens. Twilight Zone with human integrity, the tale concludes at a beautiful point of equipoise. “Daddy Mention and the Monday” tells the tale of a prisoner who attempts to conjure his way out of the prison walls by making a deal with a devil. Walking a proverbial high wire in the aftermath, the result is a great, great voodoo tale. In “Unique Chicken Goes in Reverse”, Father Leggett is called to the house of the O’Connors, and there meets their strange daughter Mary and an even stranger chicken she has named Jesus. Uncertainty and doubt creeping in regarding Legget’s faith in the aftermath of this encounter, the religious undertones of this subtle, wonderfully balanced story run deep. What reads as a goofy title is a significantly more multi-layered story. Taking Tolkien’s famous hobbits and twisting them into a light story on racism, in “Senator Bilbo” Duncan uses the alternate races of Middle Earth to analogous effect. The story probably started as a bit of a larff by Duncan, but once the ball got rolling, really started taking solid shape—and you don’t need to be a fan of Tolkien to appreciate it. The last lines of the story have been done before, but this should not detract from their humanity.